ISASecure SDLA is a certification program that applies to the development lifecycle processes of suppliers for control system products. The ISASecure SDLA certification program certifies compliance to IEC 62443-4-1 Security for industrial automation and control systems Part 4-1: Secure product lifecycle requirements (also published as ANSI/ISA-62443-4-1). a specific version of a named, documented development lifecycle process under version control that is used by that organization(s). the scope of products to which the organization applies the process (which may be all products). 2.reviews representative artifacts to verify that each ISASecure SDLA requirement is being followed for products under the scope of the process. The supplier provides a list of products for which such artifacts are available, for the various requirements. The certifier may select from among these to review. A supplier whose development lifecycle process has been evaluated under the ISASecure SDLA certification program and shown to meet these technical criteria may display the ISASecure symbol and a certificate granting certification, in accordance with program procedures. A certification references a 3-digit certification version that identifies the set of ISASecure specifications used for the certification. For example, the ABC Company development process might be certified to ISASecure SDLA 2.6.1. The program defines an expiration period for ISASecure SDLA certification, as well as actions required to maintain the certification beyond this period, i.e. extend the expiration date. The program also offers formal recognition for organizations that have made significant progress toward certification. Subject to permission of each organization, ISCI will post on its web site http://www.ISASecure.org, the names of organizations that hold an SDLA certification for their development lifecycle process, as well as those organizations progressing toward this certification, that have achieved specified milestones toward compliance. In order to obtain a certification for a product, a supplier shall hold an ISASecure SDLA certification of a security development lifecycle process that applies to development of product updates going forward, as described in ISASecure-115. The supplier may at their option apply concurrently for both ISASecure SDLA process certification and ISASecure certification for a specific product, in which case product security artifacts may serve as evidence toward both certifications. The following organizations participate in the ISASecure cybersecurity certification program, an ISO/IEC 17065 conformity assessment scheme. ISCI is organized as an interest area within ASCI, a not-for-profit 501 (c) (6) corporation owned by ISA (International Society of Automation). Descriptions of the governance and organizational structure for ASCI are found on the ISASecure website: http://www.ISASecure.org. An SDLA accreditation body will be an organization recognized by IAF/ILAC. ISASecure CB’s conduct assessments in accordance with ISO/IEC 17065 and maintain confidentiality of supplier’s assessment information at all times. No proprietary company information is ever publicly disclosed. As the owner of the ISASecure conformance scheme, random work products related to a supplier evaluation may be examined by ISCI staff at infrequent intervals to ensure the quality of the ISASecure SDLA program or to process a complaint to ISCI lodged by a supplier. a certification level of 1, 2, 3, or 4 designed to match SAL in IEC 62443. The four certification levels for a process offer increasing levels of development lifecycle security assurance. These certifications are called ISASecure SDLA Level 1, ISASecure SDLA Level 2, ISASecure SDLA Level 3, and ISASecure SDLA Level 4. 2. review representative artifacts to verify that each ISASecure SDLA requirement is being followed for products under the scope of the process. The supplier provides a list of products for which such artifacts are available to be reviewed against the SDLA certification requirements. The certifier may, at their discretion, select artifacts from among these to review. A supplier whose development lifecycle process has been evaluated under the ISASecure SDLA certification program and shown to meet these technical criteria may display the ISASecure symbol and a certificate granting certification, in accordance with program procedures. A certification references a 3-digit certification version that identifies the set of ISASecure specifications used for the certification. For example, the ABC Company development process might be certified to ISASecure SDLA 2.6.1, Level 2. The program defines an expiration period for ISASecure SDLA certification, as well as actions required to maintain the certification beyond this period, i.e. extend the expiration date. The program also defines procedures for certified organizations to obtain certification to higher certification levels. In addition, the program offers formal recognition for organizations that have made significant progress toward certification. Subject to permission of each organization, ISCI will post on its web site http://www.ISASecure.org, the names of organizations that hold an SDLA certification for their development lifecycle process, as well as those organizations progressing toward this certification, that have achieved a specified level of compliance. A supplier that holds an ISASecure SDLA process certification at an appropriate certification level thereby meets the SDLA evaluation element required to achieve ISASecure certification for their products. A supplier applying for a product certification that does not hold an SDLA process certification at the appropriate level, will undergo an SDLA evaluation at this level as a part of the ISASecure product evaluation itself. 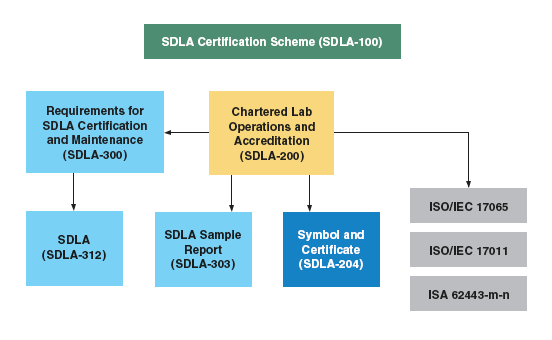 Thus the SDLA certification program provides a method for a supplier to undergo an SDLA evaluation once, such that it can apply toward all product certifications. These topics are covered in greater detail in the documentation for ISASecure product certification programs. ISASecure certification programs are designed to certify compliance to the IEC 62443 series of IACS cybersecurity standards. In the event that an IEC 62443 standard is in draft form, ISCI will establish certification requirements to the standard’s framework. Regardless, ISCI’s commitment is to maintain alignment of ISASecure SDLA process certification requirements and certification levels with the requirements and level concepts in IEC 62443-4-1 “Security for industrial automation and control systems – Product development requirements.” This standard is under development. The approved standard IEC 62443-1-1 establishes terminology and concepts that apply for the overall series of standards.